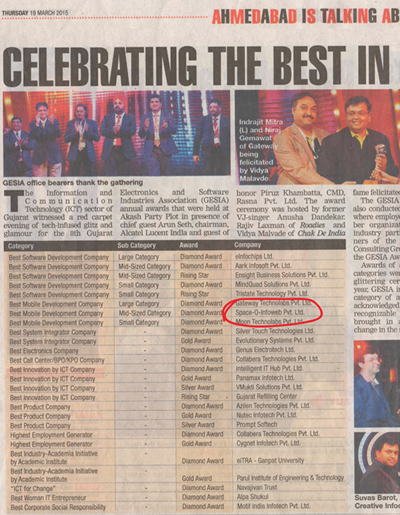 With the winning of the “Best Mobile App Development Company in Gujarat” by the 8th GESIA Annual Awards, held on 13th March, 2015, Space-O, proudly climbs one more step in their success ladder. Just from a 70K company to 25cr, in span of 4+ years, Space-O has indeed reached its space along with its brilliant astronauts (developers), who the management is proud of and often they trust & believe in “Together Everyone Achieves More”(TEAM effort). Rakesh Patel with Atit Purani, founded Space-O with just 2 employees, which has grown to 140+ employees and its vision is to reach 500 employees by the end of next year. As Rakesh says, “don’t dream with your eyes closed, but dream with your eyes open & you will see your dream coming true”, and today Space-O celebrates its “Diamond Award” in the mid-size category awarded by the Prestigious “GESIA” Annual awards. GESIA,a not-for-profit,industry-led and industry-managed association, the ICT window of Gujarat to the world, that fosters and nurtures and tracks the ICT industries in Gujarat, held its 8th annual award function that was witnessed by the crème-de-la-crème companies and the top brass of leading companies including Promoters, Directors, CEOs, CFOs, Presidents and Top Executives over 500+ Software, BPO/KPO/ITES, Telecom & Electronics companies of Gujarat State & from other parts of the Country. 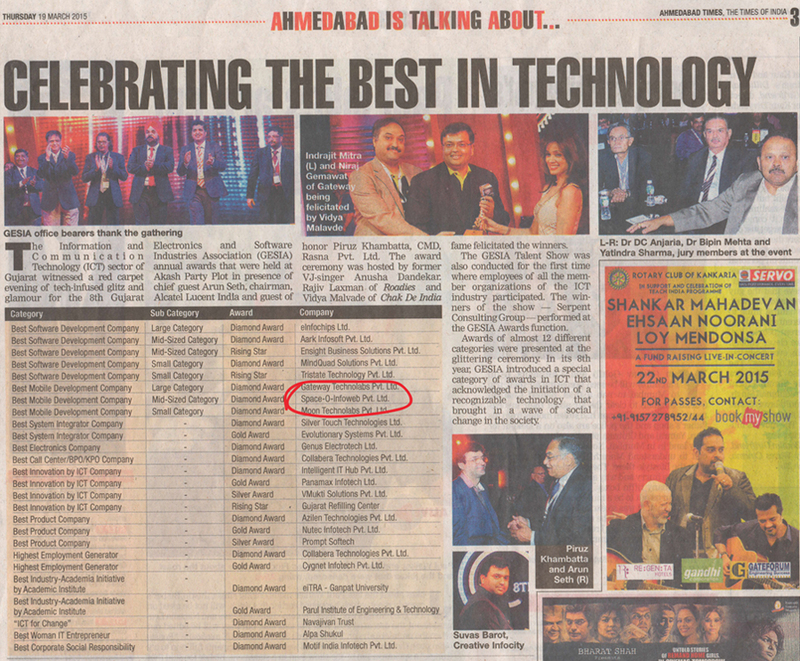 The awards were acknowledged in various realms of the ICT industry.